I don't know how you ended up on this web page. Somebody might have suggested you or you might have come to this page through some random searches. 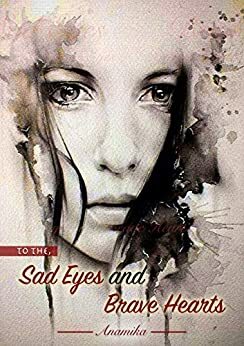 Well, as you move ahead with reading this post, I would love to tell you that I am a diehard reader of poetry and I keep myself updated about the best poetry books of 2019 to add in my kindle library. One of the poetry books I recently added to my kindle library is To the, sad eyes and brave hearts by Anamika. I loved the book cover a lot. I finished reading this book in one sitting. The poetry is written amazing. Poetry are on different themes and quite engrossing to captivate poetry readers like me. My favorite poetry from this book are: "Years Later", "Stars Under My Skin", "Crumpled Paper", and "Caterpillar To Butterfly". I would highly recommend all the poetry lovers to read this book.